Chiffoleau, Jacques (1994). "I ghibellini nel regno di Arles". In Pierre Toubert; Agostino Paravicini Bagliani. Federico II e le città italiane. Palermo. pp. 364–88. Cox, Eugene L. (1999). "The Kingdom of Burgundy, the Lands of the House of Savoy and Adjacent Territories". In David Abulafia. The New Cambridge Medieval History, Volume V: c. 1198–c. 1300. Cambridge University Press. pp. 358–74. Fournier, Paul (1936). 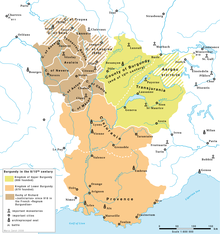 "The Kingdom of Burgundy or Arles from the Eleventh to the Fifteenth Century". In C. W. Previté-Orton; Z. N. Brooke. The Cambridge Medieval History, Volume VIII: The Close of the Middle Ages. Cambridge University Press. pp. 306–31. Heckmann, Marie-Luise (2000). "Das Reichsvikariat des Dauphins im Arelat 1378: vier Diplome zur Westpolitik Kaiser Karls IV". In Ellen Widder; Mark Mersiowsky; Maria-Theresia Leuker. Manipulus florum: Festschrift für Peter Johanek zum 60. Geburtstag. Münster: Waxmann. pp. 63–97. This page was last edited on 21 March 2019, at 01:56 (UTC).